Tag! I'm it! The food blog world has recently been hit with a round of tag where bloggers answer a series of questions about themselves and then move on to tag others with a round of new questions. I must apologize as I have been remiss in acknowledging my tags and will answer all my questions below our recipe! Becky from Baking and Cooking, a Tale of Two Loves was the first to tag me. Reading through the questions she answered I discovered that we actually have a lot in common (one of the benefits of this tag game!)... I also wanted to be a teacher when I was younger and given the opportunity I would love to cook with Rick Bayless! Dionne, from Try Anything Once, was the next person to tag me. Dionne's blog is one that I read nearly every day. She has a wonderful way of putting a good spin on everything and always brings a smile to my face. On more than one occasion her Facebook or blog comments have materially improved my mood! Again, I found things in common... summer definitely being my favorite season and the fact that we both have no problem eating food cold. RavieNomNoms, authored by Raven - our recent giveaway winner - tagged me next. Raven's posts often include wonderful recipes and I love seeing the photos of her life. While I agree with Raven that Ireland is definitely on my wish list to visit, I'll just have to wish that my favorite food was carrots! As much as I'd like to think I'd make a healthy choice, my favorite food would most likely end up including things like flour and probably butter. Trying to lose a pound or two before my upcoming weekend on Oahu (bikini in December??) has had me see a reduced carb intake. However... a few cold, rainy days here in San Diego have unfortunately given me cravings for potatoes. Potatoes have not really been on my menu for months, but walking through Trader Joe's I couldn't resist grabbing a bag of russets from the endcap, thoughts of creamy Baked Potato Soup running through my head. Bacon is another ingredient not high on my list, but without the signature salty crunch, this soup would be lacking. Sour cream provides a creamy tang and a sprinkle of cheese, green onions and avocado make this soup comfort at it's best. Pierce potatoes with a fork and for 1 hour or until tender. When potatoes are cool enough to handle scoop out the inside, mash coarsely and discard skins. Lightly spoon flour into a dry measuring cup; level with a knife. Place flour in a large Dutch oven; gradually add milk, stirring with a whisk until blended*. Cook over medium heat until thick and bubbly (about 8 minutes). Add mashed potatoes, salt, and pepper. Stir in sour cream and 1/2 cup onions. Cook over low heat 5 minutes or until thoroughly heated (do not boil). Sprinkle each serving with cheese, onions, avocado and bacon. *Note: I have had difficulty whisking the flour without creating endless lumps... I use a sealed jar and shake the flour with a cup of milk until the lumps are gone. Works better for me! 1) Who is the person that has inspired you the most in your life, and why? Funny as it may sound, the person who has inspired me most in life is my daughter, Liv. Each day since she was born, she wakes with a smile spread across her face and she continues to exude happiness throughout the day. She is passionate about the things she loves and is not afraid to show it. Her ability to "Liv Life" to the fullest each and every day is a lesson for all to follow! 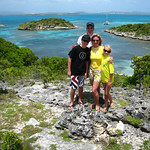 2) What is your favorite Family activity, besides cooking or eating? Our differing schedules makes getting together to do any activity difficult to organize. As such, we try to schedule vacations each year. I love getting away from the hustle and bustle of real life and spending time with all of us actually doing something together. The photo to the right is about a year and a half ago in Antigua! 3) What is the last book or magazine that you read? I just finished Captain Cook, a foodie mystery, which I won on Deb's Kahakai Kitchen giveaway! I have a recent issue of Fine Cooking in my car. 4) What is your favorite color? Yellow! 5) What do you do for your "me" time? When I need a moment to destress I frequently find myself in front of the computer "playing" with my photos. 6) Who if your BFF, and why? That would be my husband. Discussions regarding everything under the sun have been shared and we luckily have mostly the same taste in things. We make great travel partners! 7) What is your favorite go-to dish to cook or bake? I have a Mexican Casserole that is both my husband's and my favorite. If I'm at a loss, I will usually turn to this versatile recipe. 8) What is your favorite utensil or gadget in your kitchen, that you could not live without? A few years ago my mom gave me this little rubber tube that takes the papers off of garlic cloves in a flash. I love it! 1. Describe your ultimate week “off”. Off from work, cooking, cleaning and you even have a trusted nanny/pet sitter for a week! What would you do?? Easy... head for the Paul Gauguin in French Polynesia. My husband and I took our first "no kid" vacation last February and had the time of our lives!! 3. What is the holiday you look forward to the most and why? I'm not really much of a holiday person, however, if I had to only have only one a year it would be Thanksgiving. For me it's all about the food, sweet potatoes, pumpkin pie, turkey! I love the days in the kitchen with my mom, daughter and friends then sitting down to a wonderful meal together. 5. What is one thing you can do yourself that you think will make this world a better place? I love working with kids... I've worked in the classroom and as a Girl Scout leader. Helping keep kids on the right track will hopefully make the world a better place. 6. What would you do if I gave you one million dollars? (After tax.) First set the kids up for college and then move my parents even closer to me. Redo the kitchen, then take the entire extended family on a tropical vacation. Now I'm feeling guilty thinking it's all about me, so I would donate to the teachers at our local schools. 7. What is your favorite blog post published by another blogger and why? It doesn’t have to be a food blog either. Hmmm... that's a tough one. I've read so many blog posts and so many have stuck with me. One that stands out in my mind was by Chef Dennis when his wife was out of town and he made her a special dessert for her return. This one pulled at my heart! A close second is the one by yourself regarding hungry children. That one was so motivating and made me want to go out there and do something! I'm working with a younger Girl Scout Troop to help others during these tough times. 8. What is your favorite cuisine to eat? Mexican! I could eat it every single day. Cilantro is my favorite! 1. What was your favorite part of this week? Spending today with Liv - hopefully her teachers are not reading this, but she played hooky from school and we walked the dogs at the beach, watched Cake Boss on TV and had a good lunch. 2. What do you like to do when you are sick? Not much of anything... usually a hot bath with a good book. 4. What is your favorite Holiday? and why? My favorite would be Thanksgiving. I love having the whole family together. My mom and I usually prepare for a day or two and I enjoy our time in the kitchen together. Then sitting down all together is the icing on the cake! 5. What cookbook do you use more than any other? I frequently find myself turning to the Anheuser-Busch Cookbook: Great Food, Great Beer. I'm actually not really a "Bud" fan (I admit to being a bit of a beer snob! ), but the grilling recipes can't be replaced! 6. Are you a coffee or tea drinker? Both! My husband makes my coffee every morning (I know... I'm ultimately spoiled! ), but I frequently enjoy iced tea in the afternoon. 8. What got you to start blogging? (I am going to steal this one from Kate). I'm really a newbie here in the food blog world... Liv Life began only a few months ago in June. With both kids moving out of elementary school I found that I have more time on my hands now that my volunteer jobs have dwindled... being somewhat disorganized I'm always looking for a recipe that I have tried and sometimes have difficulty putting my hands on it. Liv Life is began as a means to organize and share some of my favorite foods. Thanks to all of you for tagging me. You all made me think, remember some wonderful times and actually have me looking forward to Thanksgiving! This looks delicious and so comforting! 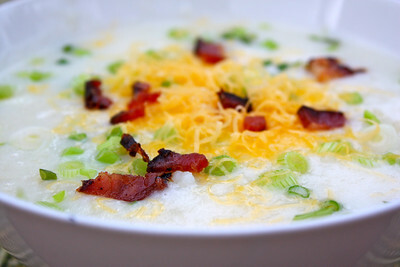 My husband and I love baked potato soup...it's always one of the first soups we make when the weather turns. Unfortunately, that takes a bit of time here in Arizona, but I'm holding onto this recipe for what is hopefully only a few more weeks :) Thank you! Nice getting to know you better through this post and your baked potato soup looks wonderful. It would have been perfect for today--cold and rainy. I loved reading all your answers and getting to know something more about you! I think it's so cute that the person that inspires you most is your daughter. Tell Liv her and Julia have a lot in common. Whew, you had alot to answer. Love all you answers. I like the soup too. You are right the blog is a perfect place to keep all those recipes that we need to organize. This looks so comforting and delicious!Fantastic combination! Your soup looks divine! I am loving these games of tag, I am learning so much more about all the bloggers. I'm in your boat too! Trying to loose a few pounds by cutting processed carbs. It's hard to say "NO" to the potato! Your soup would be perfect for a cold and rainy day. We are still having beautiful fall days here in Virginia Beach and I am starting to long for winter already. I enjoyed reading all of your answers, so nice to get to know you better. How beautiful is that soup!! Thanks for the head up on the the tag, Kim. I have been so consumed with the baseball playoffs I haven't eaten a decent meal in a week! And I'm way behind on my blogging. I'm wishing the Giants would just lose and end the torture. Potatoes. Bacon. Cheese. I am soooo in. Three of my favorite things to eat all in one? Delish! Nice getting to know you even further with all these spectacular answers! Love the soup!!! Will be made soon! Thanks for tagging me! Things are calming down a bit here, so I am looking forward to writing a blog post soon! Nothing sounds better to me right now than a big bowl of potato soup. After such a hard week, I'm in need of some comfort food. My best friend's mom made this for us when we were growing up, so I have wonderful memories associated with this creamy and delicious soup. Thank you for sharing! 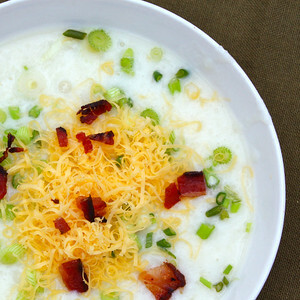 Baked potato soup sounds like it would fit with our cooler than normal weather in NH! Thanks for tagging me. I'll respond in my post that goes up tonight. We get about 4 good sized servings for dinner!